You know what it’s like, once a packet of biscuits is opened, it’s hard to stop going back for more. If you find that one biscuit is never enough, opting for a pack of mini biscuits can be a way to keep the calories down. 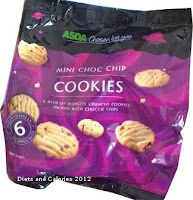 ASDA have a lovely selection of mini biscuits from the Chosen by You range (meaning they meet customers’ high standards). 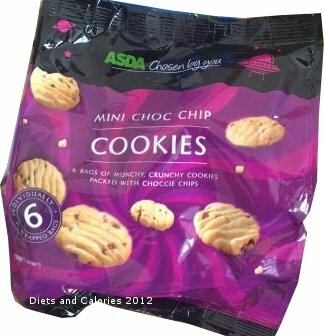 Their multi-pack Mini Choc Chip Cookies contain 6 x 25g bags of crunchy cookies packed with choc chips. Inside the mini bags are 7 mini cookies, about the size of a £2 coin. Each cookie has just under 18 calories each with the whole bag worth 125 calories. Mini Bags of biscuits are handy to take out with you or pack into lunch boxes. The overall calorie count in a small pack may be the same as two or three regular sized biscuits. However, if an open packet of biscuits is too tempting and you’re watching your weight, then individual mini bags can make it easier to stop the 'mindless' type of eating that is so easy to do when biscuits are open. Available in branches of ASDA. Nutrition Information per 25g bag: 125 calories, 1.3g protein,16.1g carbohydrate, 7.8g sugars, 6.1g fat, 3.2g saturates, 0.5g fibre, 0.2g salt. High sugar, High fat, High saturates, Medium salt.